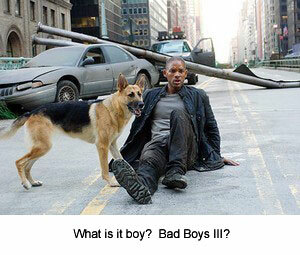 Will Smith is a bankable star, if not a likeable one. As Robert Neville, the last man alive in a city full of zombie-like/infected monsters, he carries it well without his brand of off-the-cuff humor we’re so used to in his past roles. Legend is the cautious tale of tempering with vaccines, and what could happen to the world, should a potential cure for cancer mutate, and turn regular people into night zombie/vampire creatures. Robert Neville is the last infected man alive, lives and faithfully sends out radio transmissions everyday from his base in New York. As flashbacks indicate, the virus outbreak was partly his own responsibility, and he is seemingly immune. Being a military scientist, he conducts experiments to cure the virus, but time is running out as the city is infested with the infected zombies. Pretty cool premise, huh? Legend didn’t quite fill my movie needs many terms. As a stand alone movie, it falls short in many categories. Director Francis Lawrence takes too long developing the idea that a major metropolitan city as New York has become a deserted wasteland of metal, overrun by weeds and wildlife. I get that, the audience gets that, so why dedicate more than 3/4 of the film to show it? Not exactly the sort of thing you want to continue to show if you want to prove a tired point: in Lawrence’s case, he’s trying to prove to the studios he’s worth signing on for another feature film. Hey, more power to the guy, but the focus should really have been on making the Neville a little more consistent. I remember when I am Legend was being developed by Ridley Scott, and Arnold Schwarzenegger was attached as Robert Neville. Man, those were exciting days; an A-list star and a powerhouse director. Unfortunately, it all fell apart due to overblown budgets, and this project went into development hell for more than 15 years. The names alone would have attracted me, and a master filmmaker like Scott would have been able to put the focus on the characters (ie. Matchstick men, or to a greater extend: any of his tent-pole movies) with the background as a supporting tool. As a remake, the film is good. As a stand alone movie, it’s a half hour too short, and there’s not enough directions this film could have gone. Some characters are created but not introduced; which leads to clumsy relationships. Hopefully that doesn’t spoil too much. I could only take so much of Smith talking to himself and going through the same flashbacks, of non-zombified New York. There’s also a HUGE inconsistency in how these movie monsters work as well: Neville, an army scientist records for us his findings: apparently these creatures are without any sort of proper thought process, only feeding on whatever ‘clean’ blood they find. All the actions of these creatures makes this statement true: they’re mindless zoned out creatures with lightning fast speed, only looking to feed in the night because the sunlight burns their skin. This totally undermines the entire premise of the film for me. First, they introduce the ground rules, then break them to create tension. It’s an utterly worthless gesture that only serves to confuse the audience, and tack on the next stupid move for Smith’s Character: revenge. He’s only been alone, being ever so careful for the last three years as the last man: and he does something totally out of character and completely reckless. 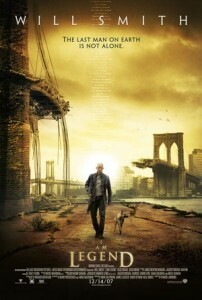 If you want flashy visuals with no moral conundrums, by all means see I am Legend. If you want a movie that will make you think about consequences: check out Children of Men.